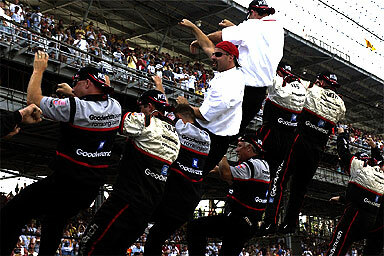 Q: Richard, watching the guys kissing the bricks, they jump up and climb on the fence, what were y'all thinking? CHILDRESS: I thought it was great. I've never had a cold kiss like that that felt so good (laughter). And I did it three times - even three times better. It was special to see those guys. I mean, I know you guys are around the racetrack, but the sacrifice that these crew members and the sacrifice that everybody makes in this sport, from their family, to their wives, to theirself, that's what it's all about, was watching those guys jump up there today and get on that fence and just getting the calls we've had this evening, be able to go back and see the families, everybody at work, from the guy that sweeps the floors to the guys that are in our engineering group, whoever, you know. It's just special. It takes special people in a sport to do it. I'm fortunate to be surrounded with so many special people. March 9th, 2004. Harvick Picks Up His Brickyard 400 Ring. When Kevin Harvick won the Brickyard 400 from the pole last August, it helped him slip out from the under the "shadow you'll never get rid of." That shadow, of course, is the greatness of late seven-time NASCAR champion Dale Earnhardt. Team owner Richard Childress chose Harvick to replace Earnhardt after Earnhardt's death in February 2001, even if it wasn't in the storied No. 3 car. One of the biggest moments of GM Goodwrench driver Kevin Harvick's career was revisited this week in Indianapolis, on March 9 to receive his 2003 Brickyard 400 winner's ring from Tony George, president and CEO of the Indianapolis Motor Speedway, and participate in a special preview showing of "NASCAR 3D: The IMAX Experience" at the downtown IMAX theater. George presented the 14-carat, eight-diamond engraved ring to Harvick in a ceremony before the showing and said: "I'm sure there will be many more. He's a great champion." Harvick, whose wife, DeLana, attended with him, graciously accepted the ring and said winning at Indy was "ultra-special." "I grew up an open-wheel fan and grew up in Bakersfield (California) with the whole Mears family and racing against Casey, watching Rick win four Indianapolis 500s," he said. "For me, this is extra-special. Obviously, for anyone who wins the Brickyard 400 it means a lot, so to come down here today, they didn't have to ask me twice. "I was ready to come and take it very happily. And we appreciate everything you guys do for the sport." After the movie, Harvick talked about how difficult it was to replace a revered racing legend. Earnhardt had won seven season championships to match Richard Petty, and won 76 races before his death in a last-lap crash in the 2001 Daytona 500. Three races into his career - on March 11, 2001 - Harvick edged Jeff Gordon by .006 of a second to win at Atlanta and remove some of the intense pressure that comes with replacing a legend. 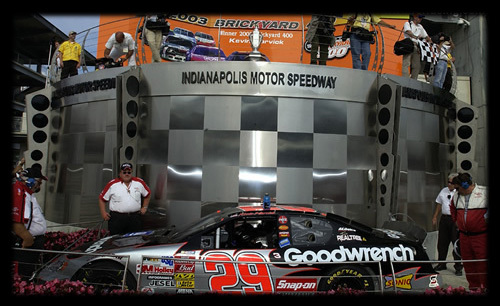 Harvick's victory in August 2003 at the Indianapolis Motor Speedway also matched the one scored by Earnhardt in the second Brickyard 400, in 1995. "To be honest with you, it was very hard at the beginning, because I've always been somebody who made my own footsteps, got to where we were by performing well and doing the things we were doing," he said of replacing Earnhardt. "I was very aggressive." 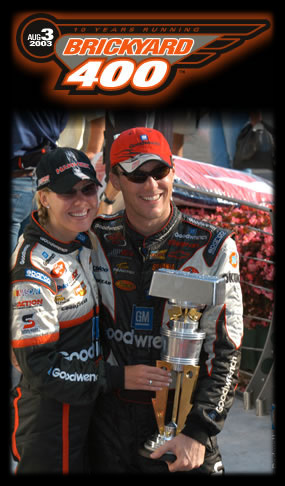 "We stepped into the situation with Dale's car and did everything we did in 2001. It was like the shadow you'll never get rid of. But he had taken our sport to what it is today. He's responsible for making the Goodwrench car what it is today, and we respect that. "But it's good now to get out of your car and understand those guys, Todd (crew chief Todd Berrier) and all the guys on our car, those guys have been with me since the Busch (Series) days, and it really feels good to know they are there for our situation." 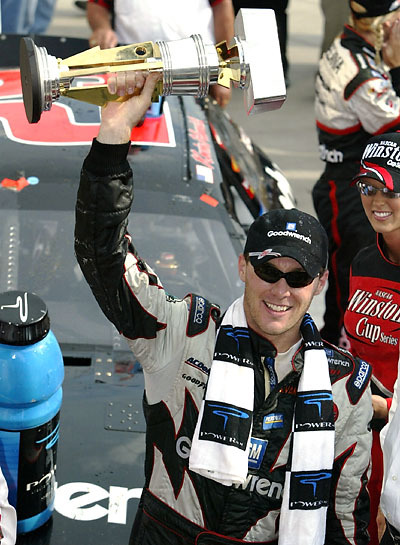 Harvick called winning the IROC title at Indy in 2002 and the Brickyard 400 pole and race in 2003 "pretty phenomenal," noting that all teams and drivers put special emphasis on the annual NASCAR classic at Indianapolis. 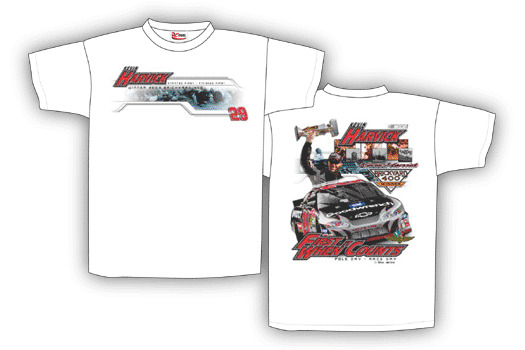 This year's Brickyard 400 on Aug. 8, 2004 is the 21st race of the NEXTEL Cup Series season. The cutoff for the Chase for the Championship - the final 10 races of the season in which the top 10 and those within 400 points of the leader will race for the title - is the 26th race. "I think the closer you get to 26, the more frantic the weeks become," Harvick said. "Being the 21st race, obviously it's worth the effort everybody puts into it. This is going to add just that much more pressure to that weekend." The movie, in some ways, is a salute to Earnhardt and how his presence brought stock car racing into the mainstream of sport in the United States. Harvick, 28, has become one of the young guns that now are the stars of the 21st century. The film takes the viewer from the early days of NASCAR to the present and then puts the viewer into the seat of the car at 180 mph, in the shops, the garages and pits. "The thing about it," Harvick said of the film, "is they used actual events, so it's pretty hard to get it wrong when you're going along using actual footage. All those pit stops and everything were actually filmed during a race. "They did a good job. And they spent a lot of time in the garage shooting inspections and through the races and things. They did a good job getting all the footage that they needed." So, what did Harvick look for in the film? It's a great day for me to get this, and it will be something I'll cherish forever."